Former additional solicitor general Indira Jaising salutes the legendary Justice V R Krishna Iyer who passed into the ages last week, the judge who restored her faith in the Supreme Court of India. Justice V R Krishna Iyer's 100th birthday was an event marked by everyone, including the prime minister of India. I was fortunate to be at the celebration to mark the occasion. To my utter delight, although he could not see, he recognised every voice, every presence and to me he repeated things we had discussed more than 25 years before. He personally attended every function in Kochi organised to celebrate his birthday. The city was dotted with posters and overhead banners felicitating him. It is not every day that you meet someone who is 100, nor is it every day that a judge who retired more than 25 years ago gets noticed by the common man on the streets of the city where he lived. From vegetable vendors to jewellers, they all had banners up felicitating him. This was characteristic of Justice Krishna Iyer; he loved everyone, regardless of their social status, and they loved him in return. Every time you met him, he would be happy and giggle like a child. He was forever young. With each one who knew him, he had a personal and special relationship; we could claim ownership over his affections. Some years ago, I was curious to understand how a man as human and compassionate as him got appointed to the Supreme Court. It is no secret that Indira Gandhi's inner circle, including the late Mohan Kumaramangalam, (whose daughter is today the chair of the National Commission for Women) recommended his appointment. He was a judge of the high court of Kerala, but too junior to be appointed to the Supreme Court in the mid 1970s. He resigned and was made chair of the Law Commission and appointed directly to the Supreme Court, not as a judge of the high court but as a jurist and former judge, a tradition that will hopefully endure. Yet, the question remained in my mind: How did this miraculous appointment of a man of the people get made at all? I made a special trip to Kochi to talk to him. It was then that I realised that he was never a member to any political party though he had strong political views. He may have been a minister in the first Communist government in Kerala, but was not a member of the party. It was this independence from all political power that made his appointment possible. He enjoyed the credibility and integrity of being till the very end and retained his ability to be critical till the very end. Until judges like Krishna Iyer were appointed to the Supreme Court, my interactions with the court has been totally hostile, an institution which I saw as an 'instrument of oppression.' For us the law was part of the 'superstructure' of an oppressive State. Until then, all we had seen in law reports was the striking down of land reform legislation, the litigation between temple priests for succession rights and so on. Being a lawyer for social justice was like being an oxymoron, a struggle and a losing game. And then, while I was yet struggling to establish some rights-based labour jurisprudence, I encountered a bench of Justice Iyer and Justice P N Bhagwati, before whom I was arguing a case of a dismissed worker waiting in line for justice over the years. My opponent wanted an adjournment, the judges were willing as was routine and I was furious, making my discontent clear. Sensing my anger, Justice Bhagwati leaned over and told me, 'If you cannot get justice for a worker from this bench, you will not get it at all.' It was then that I realised that I was appearing before a 'social justice bench' long before the present Chief Justice created it, ironically on the very day that Justice Krishna Iyer died. Later, Justice Iyer told me that what he liked about my presentation was the absence of sycophancy towards judges. He made it possible for us to think of judges as approachable humans to be dealt with by equality. To this day, when young lawyers approach me for advice on their future in the profession, I remind them of my encounter with Justice Iyer on that day and tell them not to get into the sycophancy trap, if they want to be lawyers for social justice. From then onwards, it was a pleasure to be a lawyer. He questioned our understating of law as being part of the superstructure of an oppressive State. The Supreme Court from being an 'instrument of oppression' became for me a democratic space within which I could advance my agenda for social and economic rights. He transformed the institutions he entered into public spaces where rational discourse was possible among equals. In our formative years we knew we had someone we could look up to. I became addicted to the Supreme Court and public interest litigation that judges like Justice Iyer sparked off. I introduced many young lawyers to the Krishna Iyer court. They were young and sensitive, but disillusioned even before they began their journey in law. To them, he demonstrated that the law could be used as an instrument of social change. They were inspired and have all gone on to contribute in a big way to the development of law for the people. Some taking him as their role model have joined the judiciary, others like me have stayed on as lawyers, something he regretted as he wanted me on the bench. Others have become academics and yet others have contributed to the trade union movement. His influence is apparent everywhere and this will be his abiding legacy. Justice Michael Kirby, today considered the foremost human rights judge in the world, made repeated trips to India to meet him. His judgments are quoted the world over. Many criticised his language as being unknown to the law and his judgments as being verbose. I found his judgments a pleasure to read. Indeed it is tragic that even while he died at the age of 100, the vast majority of humanity in this country continue to live in 'undeserved want' and far from making public provisions for them, their entitlements to health, education and employment are being cut by the present government. He abhorred the death penalty as for him no person had the right to take life which was given by the Lord. He was a believer in life after death and for that reason also, for him, life had to be lived to its natural end. I was deeply touched by a photograph of Justice Iyer in The Hindu published after he died as a reminder of the man he was. There he was being assisted by his care givers, one on each side, unable to stand on his own, visiting a woman victim of police torture. It brought tears to my eyes, he made old age and disability vanish in that one moment. He was not a cynic, he believed that justice is possible in an unjust world. I rejoice in the fact that Justice Iyer has left a legacy, after all, legacies no not reside in brick and mortar, but in living humans and there are many of us who have followed in his footsteps and continue to do so. Our challenge is to pass on that legacy to future generations of lawyers. 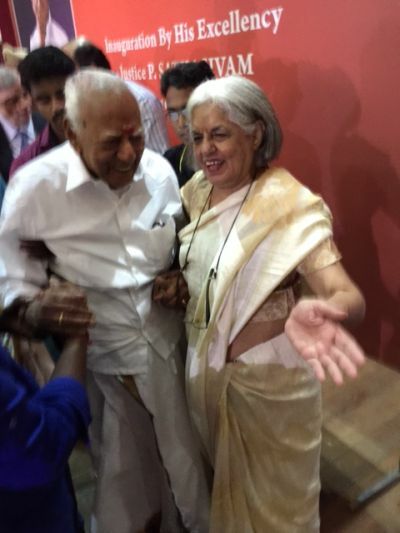 Image: Justice V R Krishna Iyer with former additional solicitor general and senior Supreme Court lawyer Indira Jaising. From Amarnath to Dhoni: How India fared against Australia over the years!